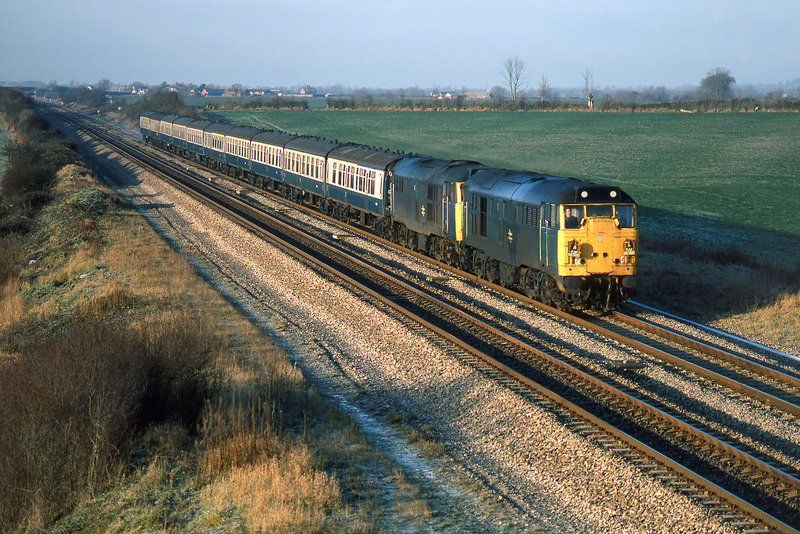 31127 & 31226 approach Circourt Bridge, Denchworth with the F&W Railtours Plymouth to Sheerness 'Kent Hopper' railtour on 5 January 1985. The bright conditions seen here didn't last, and the route had to be amended slightly in Kent due to heavy snow. Both these locomotives are no longer with us. 31127 being withdrawn with fire damage in June 1989 and cut up shortly afterwards at Vic Berry's. Leicester. 31226 had an even more spectacular end when it ran away with 31202 and ended up on top of that loco's roof on the North Circular Road in Cricklewood! Needless to say it was withdrawn, but wasn't cut up until 1991, at MC Metals, Glasgow.